Every CATV system is ready for the twice a year event – at the end of March and in early October - when satellite reception is lost for few minutes. The systems are well prepared to respond to customers’ complaints: “the temporary satellite outage is due to strong sunspot activity”, explains the friendly and cooperative cable rep.
Of course this is a myth. Those predictable satellite reception outages have nothing to do with sunspot activity. 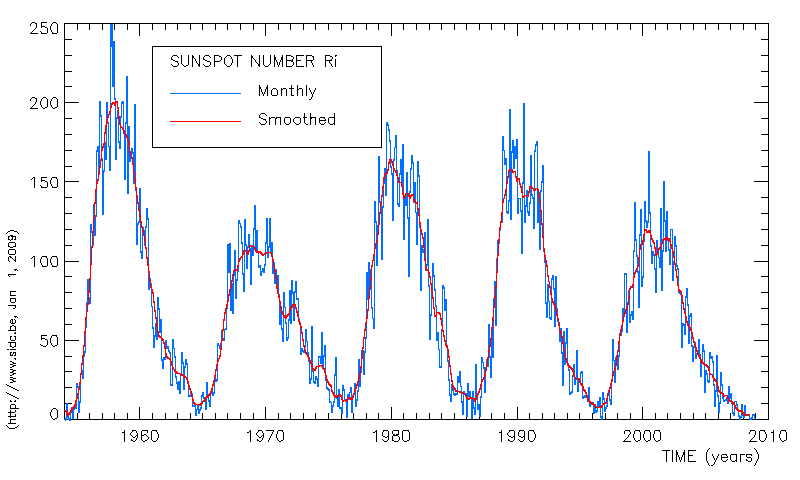 The sunspot activity peaks every 8-10 years, affecting short wave ( 5 to 35 MHz ) reception, but has absolutely no reference to C-Band reception outages. The loss of the C-Band (3700 to 4200 MHz) satellite pictures is caused by the sun, which is a high intensity microwave source. When the sun appears on the sky behind the received satellite, which happens twice a year, its robust microwave radiation overwhelms the weak (microvolts magnitude) satellite signals. The outage is brief, decreasing as the sun moves away, breaking up the line-up. Is there a way to eliminate the outage? The answer is negative -- and this is not a myth. The only remedy is the reduction of the outage time. That requires the replacement of the 3.6-meter diameter parabolic by a 10-meter dish, exhibiting a much narrower radiation pattern, thus reducing the time of the lineup, the time of the outage. Unfortunately, 10-meter parabolics are expensive. Including installation, the cost may run as high as $45,000. In case the satellite antenna farm operates nine (9) satellite dishes, the estimated total cost would amount to $400,000. All for a limited outage reduction once every six months? No responsible Cable TV executive could approve that proposal. Turning now to another myth, this one brought to us by virtue of the high-tension drama recently occupying the front page of the New York Times, between the ABC network and Cablevision over retransmission fees that threatened 3.1 million Cablevision subscribers. A stalemate in the dispute led the network’s parent company, the Walt Disney Company to pull its programming at midnight Saturday, Mach 6. The move denied Cablevision subscribers access to many of their favorite shows, and a good chance to miss the extremely popular Sunday 8 PM Oscar Telecast. Cablevision’s subscribers had few choices, some even less desirable than the others. Sign up with VERIZON, offering same day installation, provided Verizon serves the area. Receive ABC from a satellite. But can they install the satellite antenna the same day? Have all guests squeeze in front of the tiny computer screen. Visit a friend in Manhattan, provided, you have a real friend in Manhattan. Perhaps the least desirable alternative: go to your in-laws. On Sunday an ABC spokesman appeared practically every hour on the screen, reminding the audience that their station, CH 7, WABC in New York or CH 6, WPVI in Philadelphia is still available through the air, but to watch the digital pictures they have to get a digital antenna. A digital antenna? There is no such thing like a digital antenna. Antennas are specified by the TV channel to be received, or by covering a portion of the RF spectrum, such as VHF, UHF or Microwave antennas. 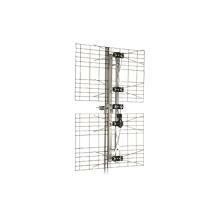 A well-designed and assembled antenna can equally well receive Amplitude Modulated, or Digital or FM modulated or unmodulated (CW) transmissions. NONE OF THESE ANTENNAS WOULD WORK IN THE NEW YORK OR PHILADELPHIA METROPOLITAN AREAS TO RECEIVE ABC. 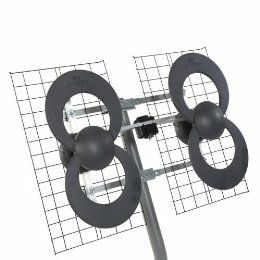 Broadcasters supposed to be knowledgeable about antennas, transmit as well as receiving antennas, and the advice to purchase a digital antennas was highly irresponsible. Is it possible that the ABC spokesman obtained this information from a Radio Shack or Best Buy store sales rep hoping to sell a good old TV antennas at an inflated price? Incidentally, both New York and Philadelphia ABC stations operate on their old TV channels, eliminating the need to apply a new type TV antenna. Unfortunately, the TV station’s technical staff did not address the myth of digital antannas, a myth believed by many people who consider themselves well informed, but who fall for deceptive myths. The ABC network programming was restored at 8:43 PM on Sunday. Those lucky Cablevision subscribers who kept their TV tuned to Channel 7 in New York and Channel 6 in Philadelphia missed only the first 13 minutes from the Oscar Telecast, which started at 8:30 PM. Were all those outdoor “DIGITAL ANTENNAS” returned to the stores, the shoppers receiving a refund? IF YOU LIKE THE STORY, SAY HELLO TO Steve.